Is not knowing how to eat optimally for weight-loss stopping you from starting? You're interested in eating optimally not just to lose weight, but to feel healthier than you have in years. You’ve done Weight Watchers for decades, done diet pills, meal replacements, supplements and the newest diets but you’re still stuck. They’re intentionally designed to give you short term results. None of those “weight loss” plans are designed for long-term, sustainable and enjoyable weight loss and improved health. That’s where Optimal Eating™teaches you how to create a sustainable lifestyle change that’s one of the most effective ways to lose weight, keep it off and drastically improve health. In my coaching program, I have a 95% success rate of clients losing 1-3 pounds a week for the first 10 weeks in a row with Optimal Eating. Some clients get off or reduce medications, reverse disease, decrease pain and LOVE what they’re eating! In fact, many of clients report spending up to 50% less on their groceries once they start eating optimally! The exact Optimal Eating guidelines for weight-loss and improved health: what foods to eat unlimited amounts, limited amounts and foods to avoid for weight-loss and improved health without eating less. How to structure meals to feel full and satisfied (and why that’s a good thing for long-term success). Why fruit and veggie diets aren't sustainable for the long-term. How to eat fruits and veggies every day without feeling hungry or deprived. The difference between a treat and a daily dessert and how to eat them without sabotaging your health. How certain health foods can impede on your results and how to enjoy them without that happening. Instructions and downloadable exercises for how to implement the guidelines and how to pick and identify easy meals you can make and enjoy right away. Nutrition Resource Guide with Trisha's recommended recipe websites, cookbooks, nutrition books, movies and more. Many programs only offer limited course access. Not here. You have access to the G & Go mini-course as long as it exists. As the course content gets upgraded (and more expensive) over time, you can keep all of your original downloads and get the new information at no extra cost. ------->>> The Guidelines and Go mini-course is accessed on a hidden website that upon purchase, you'll receive via email within 24 hours of purchasing. 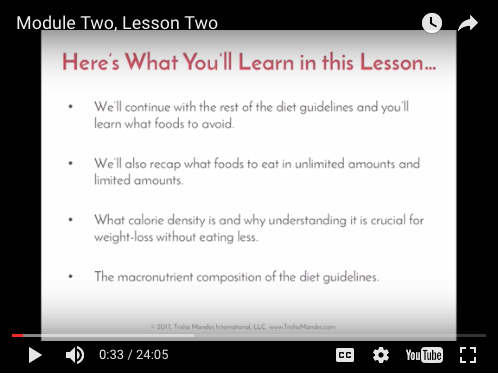 Weight-Loss without Eating Less: Introduction to the Evidence video lesson. Value $39. You get it FREE. What is a Whole, Plant Food video lesson with a downloadable worksheet. Value $49. You get it FREE. Nutrition Labels for Optimal Health: Deciphering Fact from Fiction with a downloadable cheat sheet. Value $49. You get it FREE. Trisha’s new eBook “The Optimal Eating Solution: Maintainable Weight-Loss and Longevity Even if You Can’t Exercise.” Value $4.99 You get it FREE. Are Guidelines and Go right for you? Heads up -- this is not a quick fix diet cleanse. This is how you can eat for long-term results and make life-lasting changes. If you want a quick fix weight-loss solution without having to put any work into changing your habits and lifestyle (diet shakes, diet pills, a 7 day fast) then, Guidelines and Go is not for you. Guidelines and Go teaches you how to start creating a sustainable lifestyle change on your own. Guidelines and Go also isn't for you if you're currently struggling with an eating disorder. Ready to get instant access to Guidelines and Go with 4 free bonus lessons? Get on the right path for weight-loss and improved health, now. If not now, when? What are you waiting for? You can get the healthy body you deserve and Trisha is here to help.